The commentary comes two days after a mass shooting at a Pittsburgh synagogue that left 11 people dead, which prompted Ioffe to blame the president in a controversial tweet. "And a word to my fellow American Jews: This president makes this possible," Ioffe wrote shortly after the shooting on Saturday. "Here. Where you live. I hope the embassy move over there [in Israel], where you dont live was worth it." On Monday, Ioffe went further in pointing the finger at Trump, which led to condemnation from other panelists on the program. Thats just  its unconscionable for you to say that," CNN contributor David Urban interjected. Hold on. For you not to push back on that  for her to say, the president of the United States has radicalized more people than ISIS is irresponsible," Urban told Tapper. OK, you disagree with it," Tapper replied to Urban. Its not true. Based upon what? How many camps have you gone into and interrogated ISIS folks? Do you know? What do you base it upon? Urban asked Ioffe. ISIS had like 10,000 members. I think the president has far more supporters who espouse an equally hateful ideology," Ioffe retorted. Ioffe is no stranger to controversy, having been fired by Politico in Dec. 2016 after implying on Twitter that then-President-elect Trump was having sexual relations with his daughter, Ivanka. She was hired by The Atlantic shortly thereafter before joining GQ this June. The Hill has reached out to GQ for comment. The tone deaf media still can't see they are the ones exacerbating the problem with their hysterical hyperbole and inflammatory rhetoric. She said it. I'm just reporting it. Obama created more Republicans than the RNC ever did. O.K. So far, The Donald has not created any suicide bombers. On the other hand, millions of Americans have lost their freakin' minds. Isn’t GQ a magazine for gay men afraid to come out of the closet? If she would have said the same thing about Obama, she'd be on Skid Row right now digging through trash cans for food. The raging hatred of Donald J. Trump knows no boundaries. Just remember, Trump is just our avatar. The ones they REALLY hate are US. 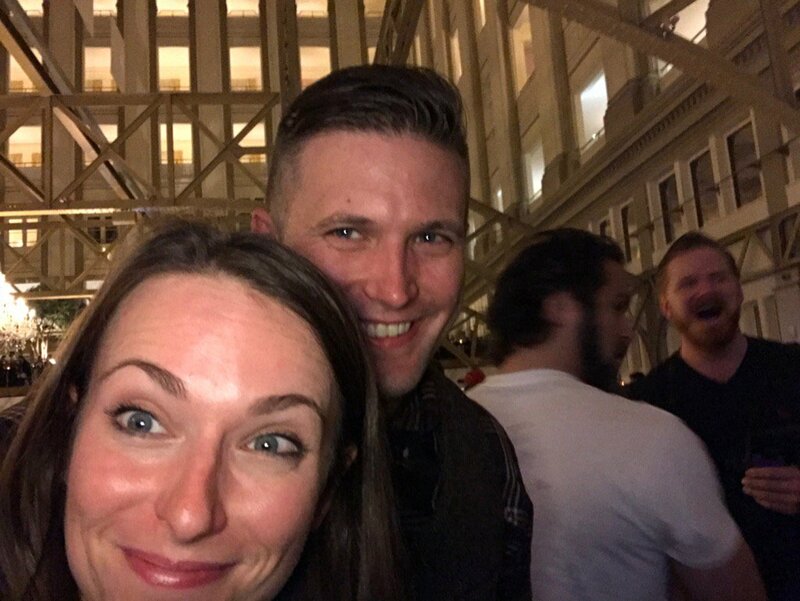 Here she is taking a selfie with Richard Spencer.....talk about being two-faced. No need for apologies Julia, just stick a filet knife into your liver, all will pass. She should have been blackballed after Politico fired her. Trump did not start this hate fest by the left! Neither did we conservatives/Trump voters. We spent 8 long years under the worst president in history! worst in what he did to our country and how he treated the rest of us. GW spent those years not saying a word.. not until after! GW’s mother was a clinton and obama fan.. so was GW’s wife. Before GW, it was the clintons, who brought shame on the oval office and our country. I know there has not been a good man in the oval office since Ronald Reagan. All that time, we saw the GOP cowtow to the dems. We saw them give the dems everything they wanted. We saw the media protect and prop up the clintons and obama. During all this, we conservatives were called names and disrespected in every way. obama was the zenith of put downs and condescending and insults. he brought the ire out in those of us who could not stand him! We didn’t demand his impeachment. We didn’t march in the streets or destroy property. We didn’t get on camera and talk about him like they do Trump. We didn’t do anything but VOTE. We voted in a man who cares for this country.. he cares for the people out here. He has accomplished more in the first 2 years than any President. The media bragged and smothered and pampered obama... they all thought he could do no wrong.. Trump!.. no sooner had he come down the escalator than they hit on him... on how unfit he was... he’d never be elected. That election night, they could hardly say the words ... Trump won. Trump is the next President of the United States! From that day till now, they have not let up on their doing their ugliest best to destroy our President. We wanted someone who did not lay down and take it from the left... well, we have him. And they on the left, are fit to be tied. They on the left hated him the first time they got a sense he was running for President.. and today they have spread that hate everywhere. We, who had been attacked by the left.. we were not worthy.. we were not fit.. and so to this day, they who are the elite.... Trump is not good enough for them! All that he’s done for good... has not broken the hate spiral.. All obama did to destroy all the good... didn’t matter to the elite.. he was fit and Trump is not! That is a nutshell version of what is going on. it shows the shallow empty suits of the elite... and the fight to control and get their power back! I still say common sense out ranks a college degree.. those degrees tend to make the owner think more of himself than he is worth. Julia Ioffe, take your magazine and stuff it or sell it to the few idiots who “take a knee”.